The last time I left Delhi, the pilot couldn’t get the plane off the ground fast enough. Gastrointestinally challenged, physically exhausted and emotionally exasperated, I literally wrote India a “Dear John” letter on the tarmac: “Dear India, By the time you read this I’ll be in Africa…” It just wasn’t meant to be. Or was it? Eleven years and three trips to the Subcontinent later, I can’t get enough of this dark carnival of a country. It is only through returning that I have been able to grasp just how impaired my first impressions were by illness, and nowhere is my perception shift more dramatic than in Delhi. We’re only passing through this frenetic capital city on a nine-hour layover sandwiched between two night trains, but I can’t help but wish I could linger and get lost for a while in this fast and furious metropolis. Don’t get me wrong: whether in sickness or in health, Delhi is not for the faint of heart or weak of constitution. This is full frontal India. Here is my recent dance card for Old Delhi in one day. 10:30am Wrap your head around Delhi’s sprawl and squalor as your train passes through the shanty towns that hug the tracks for miles in a collage of tarp cities, drying saris and detritus. In the last few years Delhi’s population has swelled to exceed 25 million, making it the second most populous city in the world after Tokyo, according to a 2014 UN report. Approximately half of Delhi’s people live in slums like the ones out your window right now. Bear witness as peasants pick through and burn trash, toddlers go barefoot and naked from their waists down and millions live life on the brink. 11:30am Step off the Jaisalmer – Delhi Express and make your way to the cloak room in a dark corner of the station. Stash your bags with the silver-whiskered attendants for the day for Rs. 30, the equivalent of two US quarters. There, that’s better! 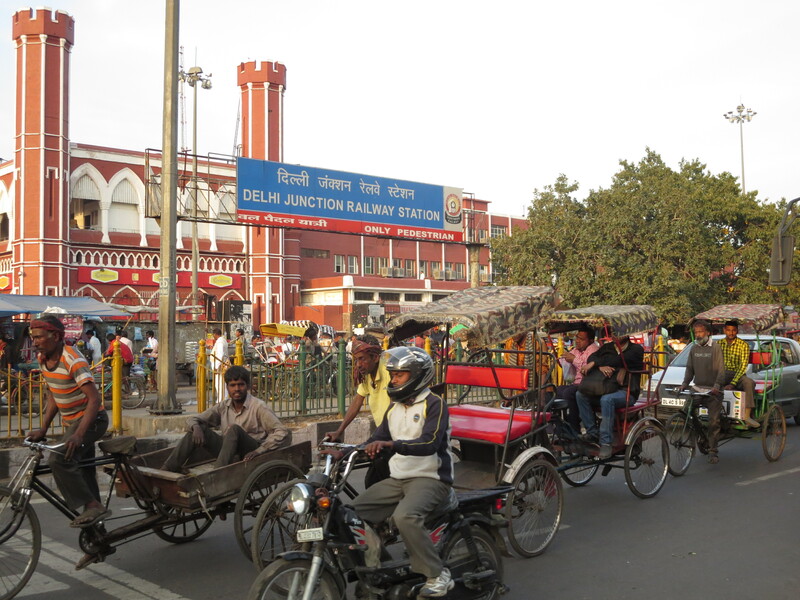 12:00pm Liberated from your bag, head east from the Old Delhi Station and step lively through the throngs of street vendors selling everything from dosas to digital watches to dhotis. Politely turn down the endless offers from bicycle rickshaws. Like Gandhi on his salt march to the sea, you’d rather stretch your legs. 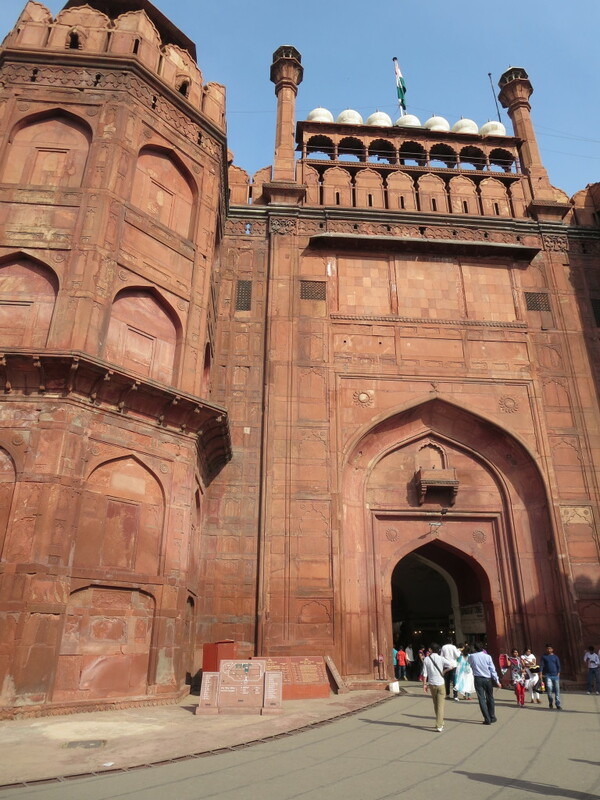 The Red Fort’s Lahori Gate, Delhi, India. 12:30pm Gawk as the intimidating, two-kilomer-long red sandstone walls of the Red Fort come hulking into view. Get your ticket and enter through the impressive Lahori Gate, which could easily accommodate an elephant parade. 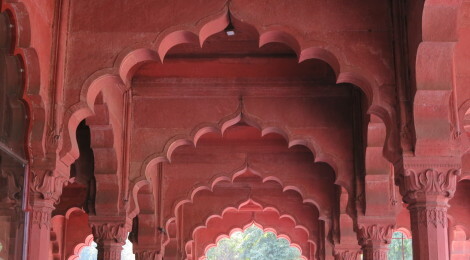 All Mogul grandeur on the outside, the interior of the Red Fort complex isn’t what you expected. Sure, the fort was plundered by Persians in 1739, and by the British in 1859, but you suspect its current state of disrepair should be attributed to the present-day authorities who are clearly syphoning off the lion’s share of ticket sales to this UNESCO World Heritage Site. Empty pools, crumbling walkways, areas that look like they’ve been roped off and decaying for years… Only the gardeners seem to be taking pride in their work: the lawns and flowerbeds create a park-like atmosphere compared to the din outside, and locals families and couples come to relax in the shade. Maharaja palaces are for fairy tales; the real Delhi is outside. 3:45pm Grateful for the Red Fort reality check, and glad to be back out in the action, make your way through the pedestrian and rickshaw traffic through a long, curving street entirely dedicated to recycling auto and scooter parts. Speculate, in passing, as to whether the deep fryers on your route are filled with snacks for the mechanics or spare parts going in for an oil bath. 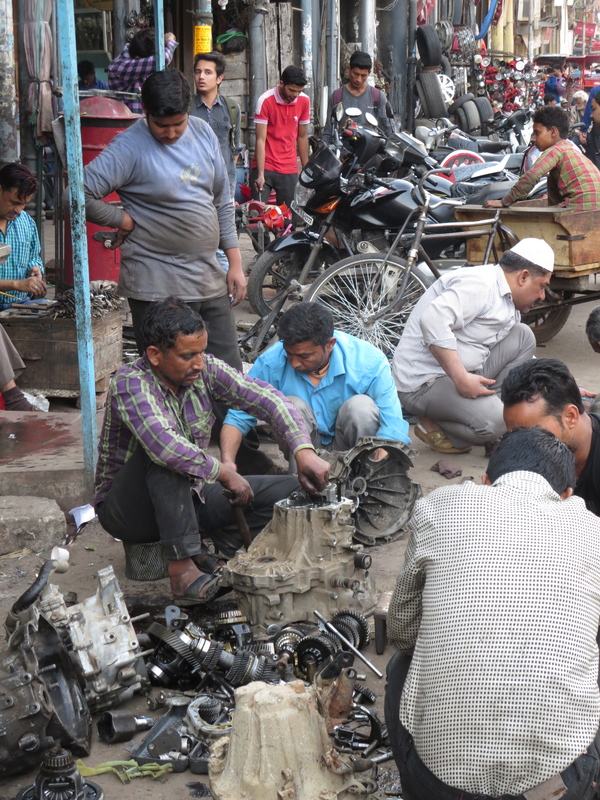 4:00pm Old Delhi is both the most historic part of the city and, today, home to the Muslim quarter. 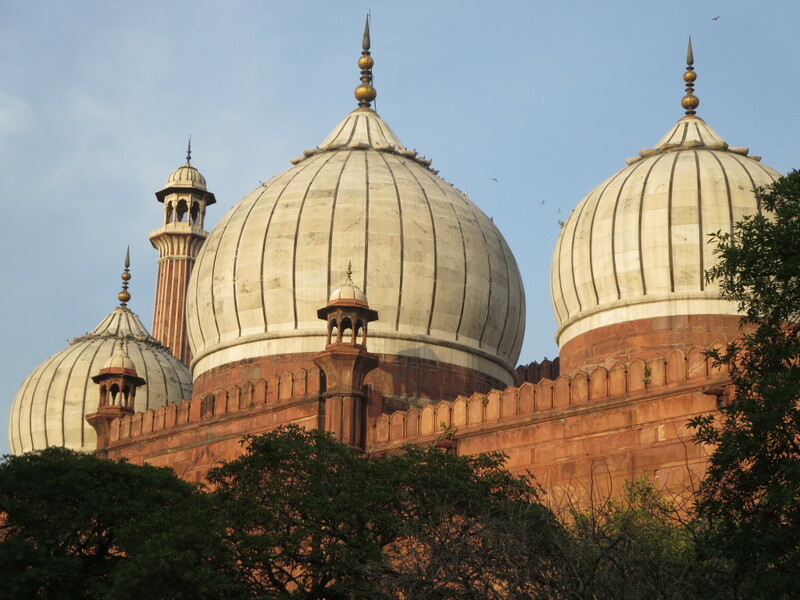 Pause to admire Jama Masjid, the ‘Friday Mosque,’ in afternoon light, and make a note to take time to visit the next time you’re in town. The Friday Mosque, Delhi, India. 4:15pm Welcome to Karim’s, a legendary seekh kebab shop founded in 1913 just off of a side lane across from the Mosque. Watch as piles of puffy naan roti are carried to tables straight from the fire. The meat is 100% garlicky goodness. Squeeze a wedge of key lime over some fresh red onion, pull of pieces of meat off with the bread and tuck in. 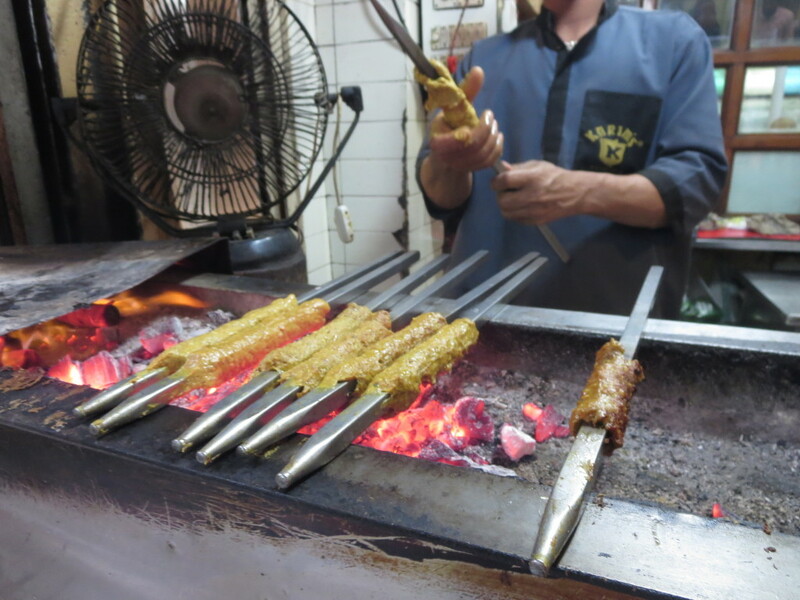 Kebab’s ala Karim’s, Delhi, India. 5:30pm Head back to the Old Town train station to pick up your bags. Stop on the way to watch boys and young men playing cricket in a park. India is in the ICC Cricket World Cup semi-finals and enthusiasm is running high. 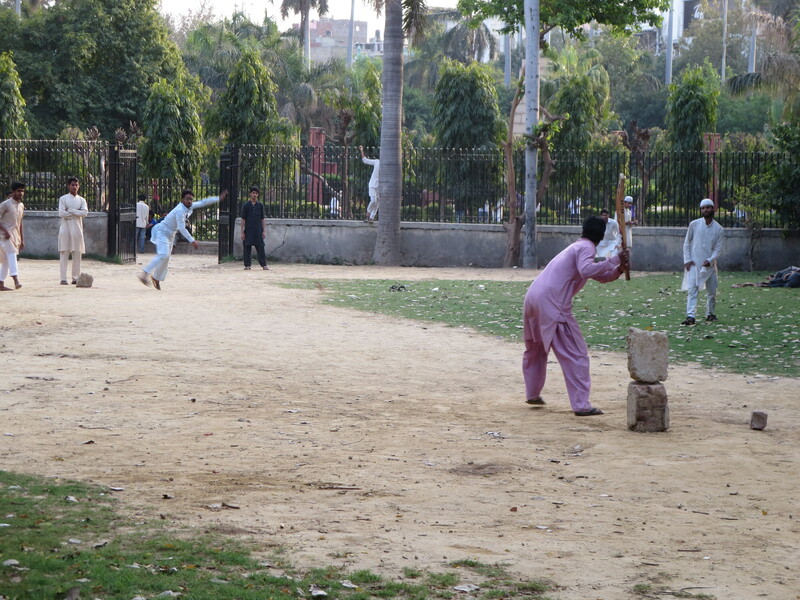 Cricket in the park, Delhi, India. 6:00pm Your night train leaves from a different station across town. 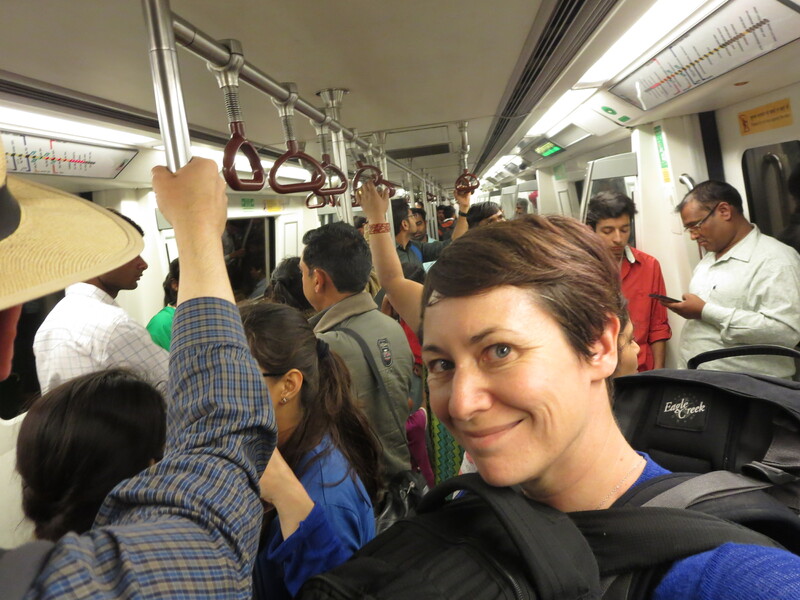 Reunited with your bags, head down the block and across the street to Dehli’s brand new Metro system, and gawk in jaw-dropping astonishment at the modernity, punctuality and user-friendliness of it all. Pinch yourself to remember what country you’re in. 7:00pm The Metro went smoothly, but your gamble that construction on the direct line to the Hazrat Nizamuddin Station would be complete turns out to be a losing bet. Instead, after figuring out through the aid of friendly locals that even Gandhiji couldn’t get there from here walking and make his train, ask for advice on a fair auto-rickshaw rate and negotiate until you find an honest driver. Cheer as he deftly navigates seemingly impenetrable traffic jams (ah, now you remember which country you’re in) without breaking a sweat and gets you to your train with time to spare. 7:45pm Stock up on water, find your platform and climb aboard your sleeper car. ← Which Would You Rather? Camel or Horse?